Cook pasta according to package instructions. Cook pancetta in a skillet until lightly browned; drain. Add olive oil, shallots and garlic; saute until garlic is lightly browned. In a bowl, beat eggs and mix in most of the cheese. Add to skillet with pancetta and stir intermittently until batter is mostly cooked but still slightly runny. 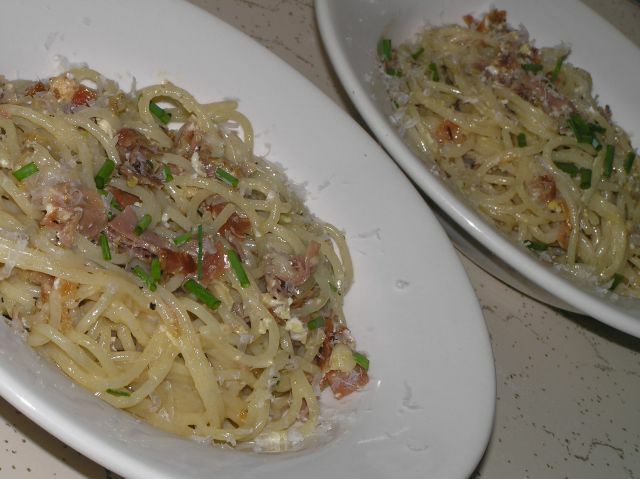 Drain pasta and add to pan; toss with pancetta mixture until thoroughly mixed. Serve with remaining cheese added to top for garnish. I added parsley and green onions at the end. Great stuff Jessica!